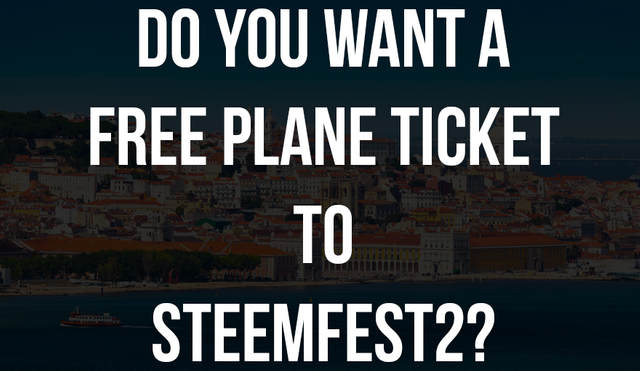 Do You Want To Win A Free Plane Ticket To STEEMFest2? ENTER NOW! Heyyy all! Man, I am pretty happy with HF 19 thus far, as many people are! So, I have already sent @everlove, the winner from the first contest, the funds needed to purchase a plane ticket to Lisbon, Portugal for STEEMFest2, and now, I'd like to send funds to another Steemian to go to STEEMFest2. This time, a couple things will change. First, I'd like to clarify that the people who entered the last one (you can see the contestants from the last one here) will not have to make a new blog or change anything to enter this one! But, the new contestants will have to make a couple changes that the old contestants did not need to do. 1. Any Steemian can enter this, unlike @aggroed's contest for minnows only, every Steemian is eligible for this one. But, if you are a minnow, I'd reccomend doing the qualifications for both of our contests. You can see the rules for his here. 2. You must do a one paragraph bio on yourself, explain who you are, etc. and you must also lay out what you will bring to STEEMFest2. 3. You must show pictures of how much your plane ticket will cost. 4. You have 7 days from now to submit your entry, all you have to do it leave your blog in the comments section of this post to be eligible. There will be a major change in the judging. I feel as if it's more transparent to let the Steemians decide who wins instead of just 3 judges. So, after the 7 days are up, I will do an announcement blog, I'll put all the entries in the comment section, and the winner will be chosen like so: you chose one comment (user) that you would like to win this contest and you will comment under that user, STEEMFest2, if you do more than one user, your comments that come in after your first will be disqualified. Please let me know in the comment section of THIS POST if you have any questions or concerns regarding the judging. @aggroed is running a minnow STEEMFest2 contest here. @joseph has a STEEMFest2 contest anybody can enter here. @steemfestdreams has a contest anybody can enter here. Please also consider voting @aggroed, @mckenziegary, and @rondonson for a STEEM witness! Lastly, if you need help with anything with STEEM/Steemit, this game, or PeerPlays or have any questions, feel free to direct message me on Discord @theprophet0, Steemit.chat @theprophet0 or in the #help channel, or for PeerPlays, stop by here: https://t.me/PeerplaysHelp - I hope you guys feel I am deserving enough of a witness vote, thank you! To me this is a long term investment. I don't have a lot to bring to the table at Steemfest2 other than enthusiasm, curiosity and a drive to see steemit and cryptos move forward as I tag along. here's what my ticket would cost. Hey Mark! Please do a blog with your entry! I entered the contest according to the above rules. Am I supposed to blog it on my blog also or do you just want me to do it there also? Yeah, make your own blog, please! Oh my gosh this is for REAL! Thank you @theprophet0 for making this happen all over again. I'm so grateful to have won a ticket from you and to know that others will also receive a blessing. Your generosity is ever-astounding. Thanks for making it happen! I am a steemer who recently joined steemit. I think I am one of the first 100 steemers that joined from Turkey. I really like blockchain and think that Steemit is currently the most practical blockchain based platform. So I try to spread the word as much and help my friends understand and join the community. I lived in Arizona for 5 years and got a bachelors degree as an Industrial Engineer. Currently work with a German company, therefore I learned how to appreciate different cultures and see the best in them. I already booked my hotel for Steemfest. (10 days after I joined steemit). If I win I will open up a similar competition within the Turkish community and pass the donation to someone from the Turkish community. P.s: We are planning a product launch at Steemfest and the products will be sold for SBD or Steem. Hello! Please turn this into a blog! Hello I have made a post about the product launch that I am planning at steemfest. Can you please check it at : @superona 's account. Your resteem would be very valuable. Thanks for this awesome project and giving back to the community - good luck to all the participants! This is definitely for REAL!!!! Oh I wanna go, Starting to clear the agenda already, see you guys out there! I am do it all human being from the tiny island of Cyprus. I missed SteemFest last year due to medical thing but I believe I am in better health now to come and meet you guys. Just gave you a witness vote! Damn I wish I could go!!! I'm happy for the lucky winner of your challenge! Amazing how people are coming together to be able to help others meet their dreams. I have never been in any platform that does it like steemit. Kudos people! Hey gmuxx! Please turn this into a blog! Great post. Upvote you,So that glad to know about you and your all post. Wow this is awesome @theprophet0, being I finally shed my minnow status (with alot of hard work) didn't think steemfest contests in the ball park for me. It's nice to see everyone has a chance....very non-censorshipy of you, the steemit way! hey sorry to bother you here like this, but I got 2 e-mail's from you from steemchat, I can not seem to get it to open tho..
so I am reaching out direct connect.. I'm not joining but I voted up to help. Thank you for the shout out, I appreciate it! I'm looking forward to seeing the outcome of the contest. i so want to go, it would be massive for me because it would also mean to be reunited with my partner who is at home in new jersey, i've not seen her for six months and i know she really wants to come back to stay with me in the uk, this would be the icing on the cake for us to be able to go to this! roger that, thank you for your comment. very kind! I really want to, but I can't leave the states right now. I will be there for the next steemfest though! Thanks for all your doing for Steemians sir! aaaand for the magnet when I get it :) You are appreciated! Spreading this to my users over at Steemit Blogger Central for you, love seeing people get some help to join up and meet other Steemians...may Steemfest be amazing for all. And thanks again @theprophet0 for your help this week, means a lot to my dad...we just got him a new fridge and everything is so much better thanks to everyone's help... HF19 also lol. RESTEEMS ARE LIVE FOR THIS, hope it helps. I love this @theprophet0 and hope as many people get to go as possible!! Wow! What a fantastic opportunity you are giving @theprophet0! Well done! Oh this would be fun :)!!! I am not entering the contest. Just wanted to say its great you are doing this. I saw the previous contest post too. Now i just wanna say Thank You, we need more generous steemians. Enjoy the fest. Amazing heart. As much as I wanted to join the contest but I could not. Im still in the process of processing my passport. After the passport will proceed with the tourist visa. Yes, we filipinos is required to have visa everytime we wanted to go overseas. Base on my inquiry to the emabassy of portugal here in the philippines, there are so many requirements. They need the full details of the what Im going to do there. That would not be a problem. 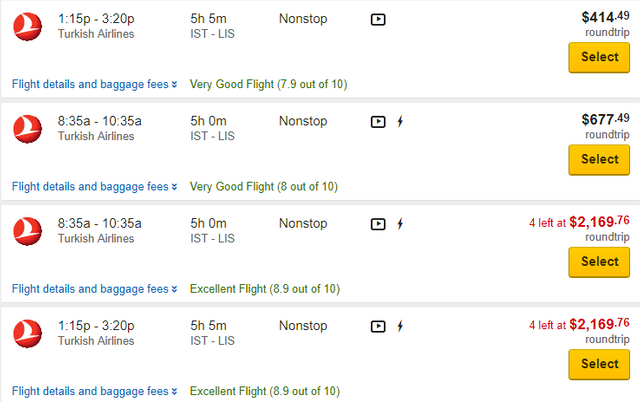 The next thing is, they will be requiring to submit all the bookings I have, like plane ticket including hotel bookings. And lastly, they are requiring me to submit a bank statement, to know if I have the capacity to sustain my stay in Lisbon. This is the big problem because my bank statement doesnt show any capacity, shame :). However, I will still continue the processing of papers, hoping that somehow I can still do it and hopefully see each other in Lisbon. I was gonna write a comment but then I saw there is "post your blog" so I'm posting what I've written up for the other two contests. Transport is cool though as I'm a pro homeless :). What an awesome contest, yet what makes it AWESOMEx2 is that you have already fulfilled @everloves dreams and now are doing it yet again for someone else! Fantastic! Congratulations on being so AWESOME! If I hadn't already voted for you as witness I surely would now. SHOUT OUT TO EVERYONE VOTE FOR @prohpet0 for WITNESS! no, but I can make time! Just got to go run this meeting, maybe have my first meal of the day, put the kids in bed and then write something up! Here is a link to my contest submission!